Mrs. Quimby-Greene has been an employee of the public school system for 20 years. 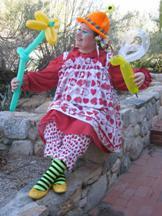 Silly Tassie will entertain guests as a Pirate, a Clown, a Fairy Godmother or Mother Goose. She can take your party guests on an adventure as Safari Sandy, the explorer. Both children and adults roll in laughter when she appears as Mrs. Wintergreene, a Santa’s wife look-alike that insists she is NOT Mrs. Claus. Interactive puppet stories, balloon twisting and face painting make Silly Tassie the perfect party entertainer for children’s birthday parties, corporate events, grand openings and baby showers. She has entertained at the grand opening of both Verizon and AT&T stores in Tucson and Oro Valley. Old MacDonald’s Farm party comes with a guitar playin’ farmer who has the guests use puppets and make animals sounds! It is the perfect party for younger children ! Mrs. Gooseberry Greene, a.k.a. 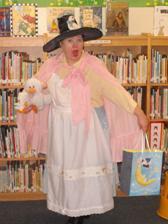 Mother Goose, read in the Bookman’s tent in the children’s area of the Tucson Festival of Books on March 14th . On March 13th, Safari Sandi read in the Bookman’s children’s tent. Thank you to the children who took part in the show!! Tucson Festival of Books on at 12:30 on March 14th. Bring your children to be part of the show!